Gorgeous! I can't believe that anyone would want to eat her! i love these, they're so cute! he has magnificent blue eyes i must say! Wow, what is it exactly? Oh, I want to hug the little sweetie! Not camera shy at all, bless him. So cute. What an amazing and interesting mammal! Thanks for sharing. Reminds me of someone in the family but I can't think who.Great pic. How sweet or in the language of the 'Furioso' 'que dulce'. Oh how cute is that - he (she?) is the game ball from El Dorado! Is he Captain Corelli's Pangolin? Its a dinosaur dog. He's beautiful. Looks like the wee beastie in 'Five children and It' - very, very cute. Pangolins are my favourite animals, just look how kindly their faces are! No - I am Pangolin! Stephen Fry My what an interesting creature. Apparently Pangolin means "rolling up" . I wonder how many ants it needs to eat to keep healthy? Oh BABY, come to MAMMA! and what did he have to say about the GFC, global warming and the melting of the polar icecaps??? 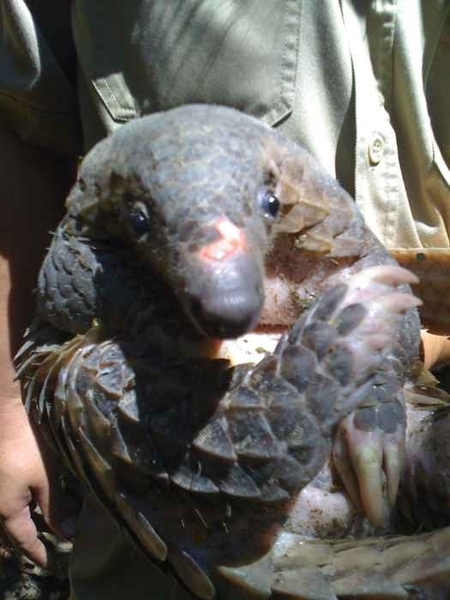 Pangolin know all..
Looks like a womble with eczema. He looks like a spikey Puggle. He has a look of wisdom about him. There is me presuming he is a he, could be a she. If you bend his snoz just a bit, you could be brothers. What a darling face. Very, very cute! So intelligent and curious looking. He has mighty looking claws. But such an adorable face. Hmm... do we trust the pangolin? Pangolin is the coolest animal name ever, so let's give him the benefit of the doubt. He looks so scoopable! Was he friendly? Awww, I want to take him home with me. Seems as though he is attempting to conceal something untoward. Perhaps he's camera shy. Is that a sore on the top of his nose? Sweet but a little spikey. There he is. Oh he is very cute. So what does he feel like? His scales are soft? I really do think he is cute. My goodness, he looks as though he's saying something very deep and educated and intelligent. That is cuteness personified. Very scaly gent. He's like a creature from Where The Wild Things Are! Just magical!